This page looks at applying for the right to enter or stay in the UK if you are the spouse (husband/wife), civil partner or unmarried partner of a British citizen or someone with indefinite leave (settled) to remain in the UK. Currently, these rules do not apply if you are an EEA national. If your partner is an EEA national, you may wish to look at applying for the EU Settled Status scheme. There is an income or savings threshold to meet the criteria for these applications. 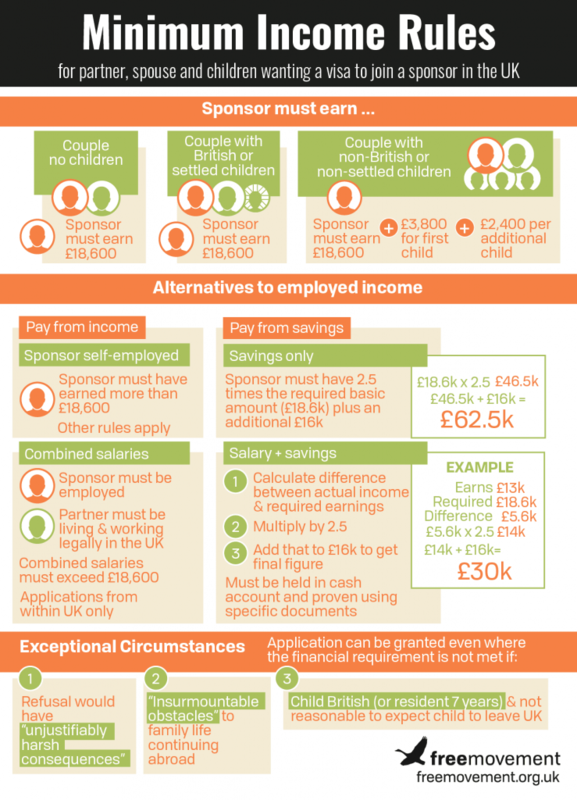 If you wish to sponsor a partner to come to the UK, you will need to be earning a minimum (before tax) of £18,600 per year (or equivalent in cash savings). If you are applying to bring a child under the age of 18 who does not already have leave to remain in the UK or British citizenship as well as your partner, this rises to £22,400 for your partner and one child, and an additional £2,400 for each further child. The financial requirements are even more complicated if you are self-employed, or if you cannot meet the threshold through earnings alone. There are also “suitability” requirements, meaning that criminal convictions, “bad character”, poor immigration history or unpaid NHS debts could disqualify you. The application forms and guidance notes for these applications are here. See the Home Office website here for the latest information on this. You will need to pay the health surcharge as part of an application under this route, unless you fall into one of the exempt categories. Read more about the health surcharge here. You cannot apply for a fee waiver for the fee and health surcharge for these applications unless you are not required to meet the minimum income threshold. This could be because your British or settled partner is in receipt of particular benefits, or if you are applying for leave to remain under this five year route as a parent. Read more about fee waivers here. If you are successful in your application, you will be granted two periods of 30 months leave to remain in the UK. After that, you can apply for indefinite leave to remain in the UK (“settlement”). Because you can apply for settlement after 2 x 30 months’ leave (60 months in total), this route to settlement is called the “five year route”. This route is also available for children of British or settled parents. To apply to bring a parent of a British citizen or settled adult to the UK, you now have to demonstrate that due to age, illness or disability, they require a level of long-term personal care that can only be provided in the UK by their relative here and without recourse to public funds. If you have the funds to support your parent so that they will not need public funds, the Home Office is likely to argue that you can pay for care to be provided in the country in which they live – it does not need to be familial care. If you cannot meet the requirements for the “five year route” – for example if you do not meet the income threshold, or you do not meet the suitability requirements – you would need to look at applying for leave to remain, and renewing it until you reach a period of ten years’ lawful residence. At this point you may be entitled to apply for Indefinite Leave to Remain in the UK.